Caterpillars feeding on leaves, butterflies pollinating flowers, decay fueling the generation of new life. The forest unfolds in quiet majesty through a network of endless interactions. Nothing is wasted. Bacteria, fungi, centipedes and tiny spiders. Enlarged using a microscope, a handful of leaf litter vibrates with energy. Oxygen. Carbon. Hydrogen. Nitrogen. These most abundant elements in human body are also among the most abundant elements in the universe as a whole. Building on previous Venvi Gallery shows, Mary Stewart’s Continuum exhibition presents a variety of landscapes in very different ways. Developed during an artist’s residency in Wyoming’s Bighorn Mountains, her Angle of Repose series combines topographic maps with paintings of the remarkable scoria rocks that litter the sagebrush-covered landscape. Her Cloudtower Series is based on photographs taken in a Costa Rican cloud forest. Enveloped in mist, the tropical foliage becomes mysterious and almost monochromatic. Zip line platforms that seem to extend endlessly skyward enhance the magical vision. Continuum connects the macroscopic with the microscopic world of the rain forest. Health in an ecosystem extends from its largest to its smallest structures. 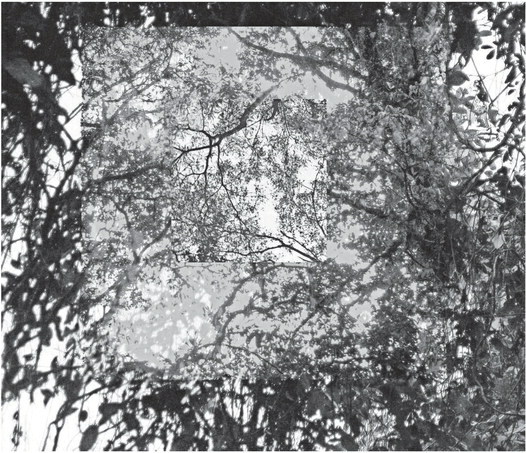 And, in The Same Stream Twice, Stewart continually re-combines the same ten digital photographs. As noted by the philosopher Heraclites, experience is ever changing:even when visiting the same location, we cannot step into the samestream twice. Born in California, Stewart grew up in the Redlands farming area south of Miami. She received her BFA in Printmaking from University of New Mexico in 1975 and her MFA in Printmaking from Indiana University in 1980. She has traveled widely, including fifteen years of teaching at Syracuse University and a Fulbright Fellowship in Canada in 2013-14. Her interest in landscape in all forms was re-ignited upon her return to Tallahassee in 2006, as a Professor in the Department of Art. Her work has been shown in over ninety exhibitions nationally and internationally, and while teaching at Dickinson College, she received two Pennsylvania Council on the Arts grants for collaborative choreography. She is also the author of Launching the Imagination: A Comprehensive Guide to Basic Design, a best-selling design textbook. She received a Southeastern College Art Association Excellence in Teaching Award in 2010, the FATE (Foundations in Art: Theory and Education) Master Educator award in 2009 and the National Council of Arts Administrators Award of Distinction in 2008. Continuum will be showing at Venvi Art Gallery through March, 17, 2017.